Anyway, I might roll my eyes when I step over the giant pot used for canning that sits on the dining room floor. And I might swear when I stub my toe on the tandoor. But I will never, ever curse the counter space taken up by my husband’s ice cream machine. That, my friends, is a kitchen tool worth having. 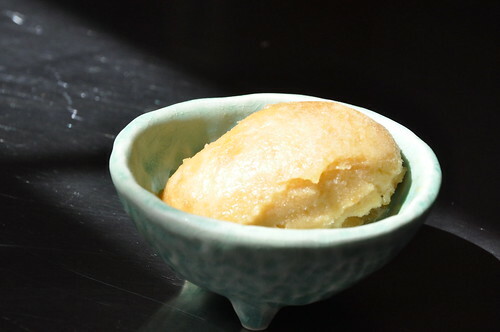 Yes, my husband’s ice cream machine churns out desserts that are absolutely divine. This blog has chronicled some masterpieces. Blueberry. Mint. Pistachio. Ginger. What could be next? 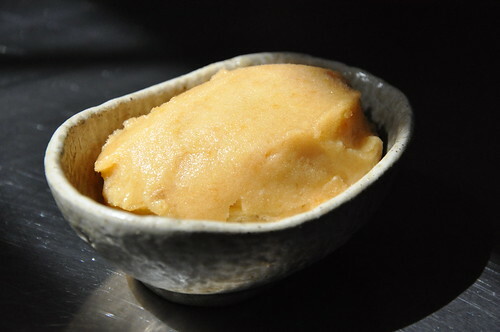 I’ll tell you: Delicious, fresh, perfect peach-brown sugar sorbet. I’m a fan of ice cream. Who doesn’t like its creamy, luscious, cold, sweet goodness? But fruit often gets lost in those creamy depths, playing second fiddle to the sugar and milk. Not so with sorbet. And definitely not so with my husband’s peach sorbet; it preserves this season’s juicy ripe peaches in a frozen matrix of sweet sorbet-ness that transports you to the sun-drenched groves where these peaches must have grown up. It’s that good. 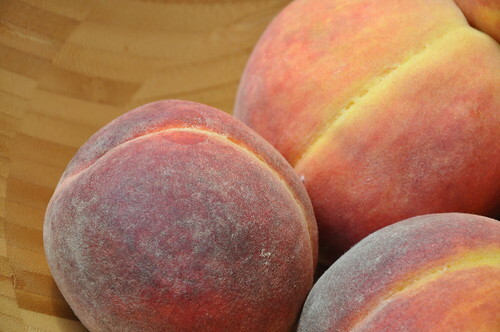 Nothing is better than eating a warm, fuzzy, fresh, fragrant ripe peach… the kind whose juices spill all over your mouth when you sink your teeth into its sweetly yielding orange flesh. For those times, though, when such a peach just isn’t handy, this sorbet is a suitable — and delicious — alternative. It may not be warm and fuzzy, but it is just as satisfying to wipe off your mouth. Take it from me: Get yourself an ice cream machine — the one essential kitchen tool — and churn yourself up some peach-brown sugar sorbet. Summer is really moments from over. I know because I was driving down the street past a local elementary school… and there were kids getting off a bus. And my little Jack is just moments from starting pre-school a couple days a week. I’m not sure I’m looking forward to this summer ending. But alas, I’ll have comfort for at least a few more weeks as I stretch the last of the season’s peaches out with this sorbet. I don’t know about most of you, but here in Northern Virginia I’ve felt we’ve had a pretty good season for peaches. Lots of truly ripe, beautiful and juicy peaches this year seemed to come my way. The result has been lots of time to experiment with them and think of ways to manipulate and extract every delicious ounce of juice from them. This is probably one of my favorites and one of the most simple. Really, it comes down to this: Peel, blend, cool, churn, and freeze. You are done. And you have an awesome result. 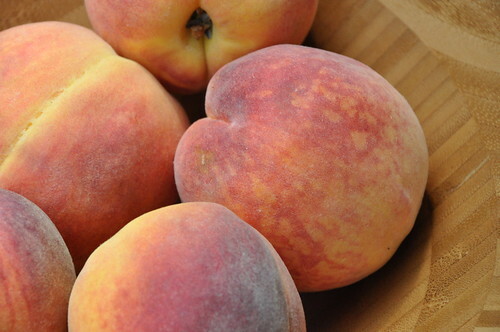 So, not much advice here, except to pick the sweetest and juiciest peaches you can find. When you no longer can eat them fresh, dripping, and about to be lost forever to the natural state of things, turn them into sorbet. 1. 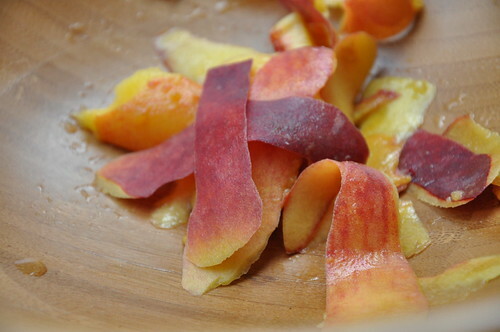 To peel the peaches, you can simply use a vegetable peeler to remove the skin on firmer fleshed fruit. 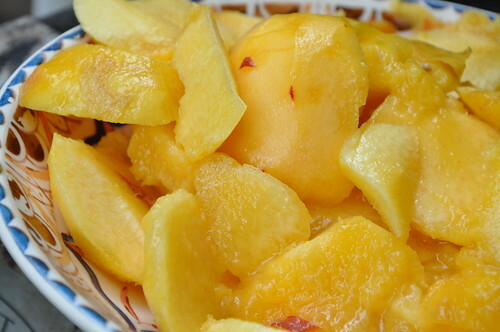 However, if the peach is too soft, you can bring a pot of water to boil and prepare an ice bath. Cut an ‘X’ in the base of each peach and then drop them gently in the water for 10 seconds before moving them to an ice bath. The skins should pull up easily. The same technique can be used to peel tomatoes. 2. Combine all the ingredients in a blender. Blend on high until mixture is homogeneous. Move to small container and refrigerate overnight or move to the freezer for about 2 hours. 3. Churn according to your ice cream maker’s instructions, and then move to the freezer. Let set for two to four hours in the freezer before serving. An indoor Kitchen countertop ice cream maker??? Never heard of such an animal, but I want one now…what’s the brand name and model type of yours? I would love to change that with that rotten bread maker my wife bought me a few years ago. Ice-creams and sorbets become so much more accessible (and cheaper)once you’ve got your ice-cream maker, no? I’ll have to make this to stash away for those wintry months. Thanks for sharing! I’ve made peach ice cream twice this summer and both times the results were disappointing. This sounds like a delicious recipe though, maybe the third time’s the charm! Oh, yum! I also loved the previous post about green bean and tomato salad – I have something very similar on the menu plan for tonight. Hi, what kind of ice cream maker did you decide on? I have had a Cuisinart, disappointing. Have the kitchenaid ice cream adapter bowl etc. Doesn’t work if the bowl is too cold, paddle gets stuck. Soooo, what did you get? Great read! I’ll have to make some of this soon! be sure to review restaurants at http://tinyurl.com/26okadh !! coming again to your blog for more soon.